I enjoy getting email from readers — for me, it’s a faster, easier, and cheaper mode of communication than snail mail. If you would like my autograph, a signed bookplate, or a reply to your letter, write to me with your request and ENCLOSE A SELF-ADDRESSED STAMPED ENVELOPE! This is important. If you do not enclose a self-addressed stamped envelope, I cannot absolutely promise that you will receive a reply. I will try my best, and I answer most, but in times of stress there has been slippage. My snail mail address: 12 Brookside Drive, Delmar, NY 12054. After answering a series of individual emails on this topic over the past two decades or so, I finally decided to get around to providing a general description of a typical visit. Hopefully it will help to answer questions in advance and give you some idea if I’m the right guy for your school. Before I go into more depth, please feel free to contact me directly. Shoot me an email. We can chat on the phone if you’d like. I’m glad to answer questions, discuss visits, and I’m genuinely grateful for your interest. I very much enjoy speaking with students at any grade level, though, of course, the content of those talks varies according to age level. Fortunately, I’ve written a range of books that are appropriate for kindergarten up to middle school, almost all of them available in paperback at affordable prices. Typically, I’ll do three 45-50 minutes presentations during a full-day visit. In addition, schools sometimes like to set up lunches with a small group of students, and I’ve always enjoyed that. Lately I’ve come to prefer a shorter, 25-minute Q & A session with a select group of motivated students over a full-blown lunch (and all that chewing). I am also very happy to sign books. It is understood that the sponsoring organization will handle all book sales. For the best results, I’ve found that it makes a huge difference when students are familiar with my work and have thought about questions in advance. Like just about everything else in life, what you get out of it is in proportion to the energy that’s put into it. If the school leaders are excited and enthusiastic, that energy transfers to the students –- and we all have a terrific, rewarding experience. I don’t juggle, blow bubbles, or stand on my head. I’m an author talking about what I do for a living, reading a bit, answering questions, all (hopefully) in an authentic and engaging and inspiring fashion. Fees are available upon request. I do try to be flexible to the specific needs of each individual school. For schools that require serious travel, it works best for me if 3-5 days worth of visits can be arranged with different schools in your district. Sponsors should plan on paying for travel expenses, which can be shared with other area schools. I can’t tell you how often I am asked to visit a school in, say, Montana. For one day. And sadly, that just never works; there has to be more of a coherent, cohesive plan to get me from here to you, way out there. That said, in the past I’ve been to SC, FLA, CT, MA, NJ, PA, IL, MI, OH, OK and more. But my real dream is a week in Hawaii. So come on, folks, let’s make that happen! July, 2013, saw the launch of a new series of books for me, called SCARY TALES. I am proud of these books, and I’m confident the books will reach even reluctant readers. They are best for grades 3-5, but these things are hard to pin down. As a visiting author, I fully recognize and respect that distinction between, say, a parent-purchased book in a store compared to a guest author in a school, where children do not have choice. If I do touch upon the series during a presentation, it will be in terms of using the imagination, asking “what if?” questions, story-building and characterization. I do not dwell on anything scary. Mostly grades 1-3 tends to focus on the Jigsaw Jones books, which are now back in print with more to come! January, 2019, will see the launch of two books in a new chapter book series, “The Big Idea Gang,” for grades 1-3, possibly 4. 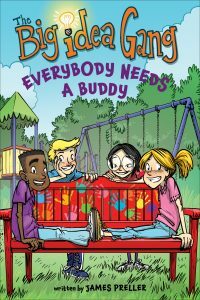 The books feature four central characters who use their powers of persuasion — at times, gently guided by their teacher, “Miss Zips,” to make a positive difference in their school community. So far, those changes amount to a new school mascot, a buddy bench in the playground, and a “bee friendly” garden behind the school. The stories are intended to be light and entertaining — even funny, hopefully — while quietly demonstrating the key qualities found in persuasive writing as it is taught today in elementary schools. So far, three titles are planned for “The Big Idea Gang”: Everybody Needs a Buddy, Worst Mascot Ever, and Bee the Change! My wild hope is for teachers to see these stories as mentor texts, and that they might inspire young people to become actively engaged in making a positive difference in their world. The popularity of the book, Bystander, opened up new worlds to me, specifically middle schools. In many schools around the country, Bystander has been widely read and shared, sometimes with an entire grade or school, featured in a “One Book, One School” context. The idea is that it can serve as a positive, educational springboard for conversations and activities about the dynamics of bullying, and the various roles we all play in those situations. But I stress: it’s a story, a work of fiction, and I have been a published writer of children’s books since 1986. (You remember ’86, don’t you?) 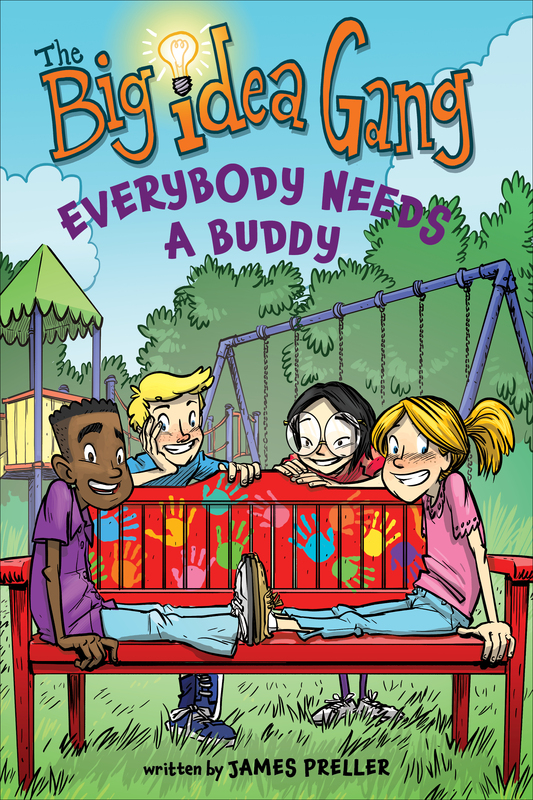 So while I am thrilled and honored to speak to large and small groups about this book, and the issues within it, I am not an anti-bullying presenter. I don’t offer ten easy steps for bully-proofing your school. I don’t climb on the soapbox. I love to visit middle schools, I am fascinated and inspired by this age group (today, 2012, I share my home with a 6th-grader and an 8th-grader), and I care about this issue very deeply. But I approach it as a writer, if that makes sense. Oh, please, just write to me and we can chat about it in more detail. Click here for information of book-specific, Q & A-centered Skype visits. This is a good option for passionate teachers from far-flung locations where it’s unlikely I’ll be able to visit. For more on a James Preller-styled school visit, plus some advice of running a successful author visit, you should click here. Really, that will tell you all you need to know. But if you really dig research, go to the “School Visits” icon on the right sidebar, under “Categories,” and click madly, deeply. Here’s one particular post you might find instructive. So, there it is in a clamshell. I look forward to hearing from you! Hello! Looking for a super author for a school visit–and your name popped up first! Timing-next school year, anytime from January-June. we are a K-6 grade charter school located in Paterson , NJ. Are you available to visit our school? Thank, Dain. I’m at: James Preller, 12 Brookside Drive, Delmar, NY, 12054. Dain, I did get it! Thank you. It’s on my “to do” list. Hi big fan of the books but I have read them all =/ could you possibly make more please this is such a good book series !!!!! I was introduced to your work by my daughter Emily, who at the time was a Hamagrael student. I am also a neighbor of yours, but we’ve never formally met. I’m am the Director of a local literacy program and I’m looking for a speaker for a speaker for an event. I was hoping I could walk down and drop some information off in your mailbox today. Please contact me at your earliest convenience so we can talk further. Thanks so much. Awesome books and site. Wish I would have found it when my kids were still in school. Thank you for visiting our school today. It was really nice to meet you. We have read many of your books in class and we have enjoyed them. We especially liked the “Scary Tales.” We are looking forward to your next book. Thank you, I had a tremendous day in Catskill. Hi we are reading your book in class, great job by the way, but we are kind of having a debate on the dramatic irony on page 143 and 144. My teacher thinks it is how David doesn’t know what group he is getting into. We think cause it says nothing about it, it is that the bullies didn’t know Mary was watching because they left. I couldn’t research anything on this, but I wanted to come prepared. Can you share your point of view on this? Interesting question. You got me to pull out that book, not sure I’ve read that section in quite a few years. I hate to side with a teacher, naturally, but in this case . . . for me, at least . . . that was the key to that scene. How David Hallenback had “found a way to belong.” Because of course he didn’t, and the very attempt betrayed everything he should have held onto as a good person in this world. He wants to belong to a group. But at what cost? On Mary, it’s complicated. We are beginning to see her shift. At same time, she wasn’t quite all the way there yet. Didn’t warn Eric, wasn’t able to go that far. She watched. When were asked to answer this question about dramatic irony we all knew that David finding a way to belong was a BIG part of the story (even if it wasn’t the best choice for him) my teacher thinks that because David doesn’t know what he is getting into its dramatic irony, but we think that the bullies didn’t see Mary so they didn’t know she was there that was dramatic irony. Thank you for your earlier feedback I had a pleasure talking to you hope I convinced you. Also, what is your favorite part of the book? Mine is when Eric gets the satisfaction of taking back his CD.